The Scheller College of Business is nestled in a city that has a rich history in civil and human rights. At the Scheller College, we embrace diversity as one of the foundations of both successful business strategy and a world-class educational experience. We share Georgia Tech’s dedication to promoting the understanding and appreciation of human differences and the constructive expression of ideas. We welcome individuals of different race, ethnicity, culture, religion, language, socioeconomic status, citizenship, national origin, gender, sexual orientation, age, and physical ability. And we celebrate the interactions that occur when students bring a diversity of life experience into the classroom. Scheller College values and respects the diversity in its myriad forms represented throughout the College. Scheller has a long-standing commitment to recruiting, supporting, and advancing women and professionals of color across all of its programs. Diversity in all of its forms is one of Georgia Tech's greatest strengths. We are committed to creating a culture of 'inclusive excellence' at the Scheller College where all individuals feel invested and engaged in our business school's mission. Scheller College is connected with the ranks of the top technology women in Georgia by partnering with Women in Technology (WIT). For more than 20 years, WIT has been striving to progress the role of women in the tech industry and to better STEM education opportunities for girls. The organization's work advances women in technology—from the classroom to the boardroom—by providing advocacy, leadership development, networking, mentoring, and technology education. Women in Business is a student-led organization at the Scheller College. Through social activities, professional development events and career-networking opportunities, the club supports and empowers Scheller MBAs to become successful business leaders. The sense of community that I have found at Scheller is without comparison. I have the most respect for my classmates, and we are all truly invested in each other’s success. What has the academic experience at Georgia Tech been like? I did not realize the applicability of my classes until my internship, especially compared to my intern peers from other MBA programs. Entering the program as a student with minimal training in any software or relevant business discipline, the core classes gave me enough baseline knowledge to be able to understand a breadth of things quickly, from corporation-specific IT jargon to complex SQL queries in Teradata to ways to manage up for my work streams. Moreover, the professors are very accessible, understand their audience, and are incredibly open to feedback during the course in order to tailor classes toward what a particular set of students want to learn. What opportunities have you had to gain hands-on experience? The practicum courses present opportunities to work with a diverse set of companies on relevant, thought-provoking questions. Last semester, I was able to work with two companies. The first project involved an automotive conglomerate that asked us to investigate how they could continue to be competitive in an industry that is being transformed by the Internet of Things and the autonomous vehicle. My second project was with an Israeli technology startup for whom we formulated a go-to-market strategy for their linguistically-based tech algorithm that increased digital user engagement and conversion. For the second assignment, my team and I were able to go to Israel to meet with the client and experience the culture firsthand during the Jewish holiday of Purim. That week in Israel gave me a glimpse into the life and mindset of my client, and I know that view into client relationships will follow me well after I finish my MBA. What has your experience been working with the Jones MBA Career Center? Having a non-traditional background was a major concern for me going into the MBA program. I frequently wondered how companies would view me and if they would even consider my resume, not to mention interview me. The strength of the on-campus recruiting relationships between Scheller and especially tech companies and Southeast U.S. based companies gave me a chance to interview at more Fortune 100 companies than I could have ever dreamed. My career advisor has been the most generous with his time and patience and has helped me through any problem I have encountered from fleshing out my story to reducing anxiety before an interview to giving me a reality check on what I could and could not realistically accomplish in a job search. He has coached me from the summer before I started to road map my year, all the way through the end of my second semester to give me advice on how to succeed during my internship. Scheller College is a proud member of the Management Leadership for Tomorrow (MLT), a distinguished nonprofit organization dedicated to empower African Americans, Latinos, and Native Americans with the skills, coaching, and connections they need to lead organizations and communities worldwide. MLT helps partner schools better reflect the rich diversity of the global business community and society by providing unique insights, actionable strategies, and efficient access to the best pool of diverse MBA candidates. We had the opportuntity to connect with 300 MLT MBA Prep participants June 16-18, 2017 at their summer conference, which was hosted right here at Scheller College. As hosts for the event, we were able to showcase why our school is an ideal business school for career advancement and management education. We support the mission of the National Black MBA Association, which is comprised of minority MBAs, business professionals, and MBA students. Each year, a large number of Scheller College students attend the National Black MBA Conference, one of the largest professional development and job recruitment events in the nation attracting more than 9,000 attendees. Scheller College provides support and preparation services to our students attending the conference both before and during the events, including practice interviews, workshops on conference management, and engaging alumni as industry experts. Focus is a program that raises awareness of graduate education to underrepresented minority students. It is designed to attract the best and brightest students across the nation and encourage them to pursue graduate degrees at Georgia Tech. Current third- and fourth-year undergraduate students are invited to apply to attend this program, which gives participants an opportunity to visit Scheller College, obtain assistance with the application process, and gain insight into financial resources. Blacks in Business is dedicated to the academic, professional and personal development of its members. 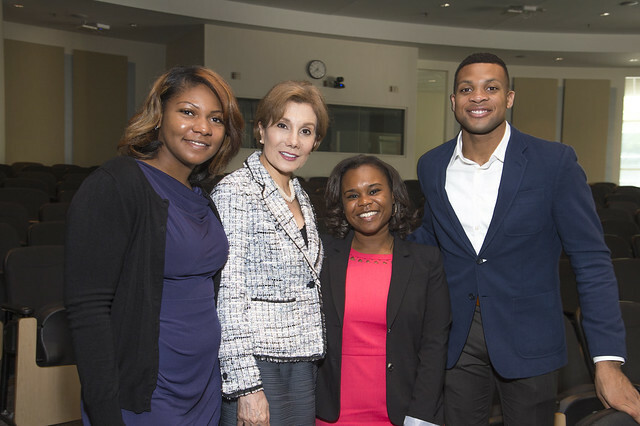 The organization supports the recruitment of diverse students to the Scheller College of Business and welcomes all Georgia Tech students who support its goals. Its mission is to promote the advancement of all Blacks in Business members through the provision of quality resources that foster the successful progression from student members to highly effective Scheller College alumni. There is a plethora of opportunity to be involved in clubs, as well as to start your own if you feel emboldened. Some of my peers and I started an organization called Blacks in Business where I am now serving as president. Why did you choose Georgia Tech over other MBA programs? I chose Scheller because it provided me with a great mix of business and technology. Not many programs have a top-tier engineering program right across the bridge, and having access to those individuals is what truly sets Scheller apart. Also, I love that Scheller has VentureLab and right down the street. Eventually I plan to start my own technology firm, so having these resources available are of great value to me. Why did you choose the Evening MBA format over another MBA format? I chose the Evening MBA format for its ability to allow me to learn key business concepts and apply them directly to my current work environment. There have been multiple occasions where the topic discussed in class the night before was necessary the very next day. Please comment on the relevance and quality of the program to your career goals. I feel that the Scheller MBA has prepared me for more leadership experience, whether it be with my current company or another company. I know that with the network as well as the skills I've gained in this program, I can be successful as a consultant as well as a business owner. How has the MBA program allowed you to approach innovation? Coming from a technology-focused background, my approach has always been "if you build it and build it right, they will come." What the MBA program has taught me is that this is not always the case. Of course, it's important to have a great product, but there are other externalities that you must take into consideration when developing a new product (e.g. network effects, supply chain, complimentary products, etc.). Georgia Tech is a global institution that thrives on the contributions from its diverse student population. This student-led club provides support and programming that celebrates international heritages. It provides an opportunity for students to connect with other international members of the Scheller College community, as well as introducing all MBA students to various world cultures and traditions. My goal in pursuing an MBA was to learn business and entrepreneurship skills in the U.S. so I can participate in developing the startup environment in Morocco. Starting my own company in Morocco. I am working on a digital marketing startup idea developing a product to allow retailers to give real-time promotions to select customers. Winning the PhD2Consulting case competition. I led a team of three MBAs and one Ph.D. student developing a set of strategic recommendations for the Atlanta Community Food Bank. Our solution focused on increasing the capacity of food pickup and delivery and providing a framework to evaluate different investment alternatives. Not only did we win the first place award, but the client was so interested in our work that they brought us onboard as pro bono consultants. Corporate Finance, Technology Commercialization, Managerial Economics, and Strategic Management. Why did you choose Georgia Tech Scheller College of Business? Scheller College of Business provides a unique curriculum at the intersection of business and technology. I am very interested in entrepreneurship. The TI:GER program, which is a hands-on technology commercialization and entrepreneurship program, was a key element in choosing Georgia Tech. My experience in the TI:GER program, working with scientists, lawyers, and business leaders to take a medical product from the lab to the market. Our team concentrated on the commercialization process for a medical device that regulates and monitors blood glucose for people with diabetes. It's a solution based on electrical stimulation and bypasses insulin—a real game changer for patients and the medical industry. What's your best advice to an applicant to Scheller? Be prepared to challenge yourself. An MBA requires you to be the best version of yourself. I tried to start a new business with some friends. We had a good product but we lacked the business acumen to sell it." I practiced beekeeping for some time. This student-led group is committed to assisting transitioning service members and veterans who are interested in pursuing an MBA. Members take great pride in their military experience and are proud to be a part of the Scheller community. We value the leadership and problem-solving abilities that military service men and women bring to our MBA programs. We're committed to helping you develop the skills and network you need to succeed with military friendly MBA programs for active-duty and reserve personnel, as well as veterans. I am proud to say that I was a founding and active member of the Scheller MBA Veterans Club. We started as a social club but became a crucial part of the behind-the-scenes running of the MBA experience. Community Work and Leadership Roles in Business School? It has been great to join other students who have a passion for giving back. I am proud to say that I am a founding member of the Scheller MBA Veterans Club. We started as a social club but became a crucial part of the behind-the-scenes running of the MBA experience. I've also been active with the Scheller MBA Philanthropy Club, which sponsors a portion of a local Beltline trail and helps keep the park free of litter. I am became a Volunteer Skilled Supervisor for Habitat for Humanity and have led the Georgia Tech Geotechnical Engineering Club to get involved with Habitat for Humanity as well. I am most proud that I was able to earn two full graduate degrees in two years at Georgia Tech, one in a technical field (M.S. Civil Engineering - Geotechnical Engineering) and one in a management field (the MBA). It was a requirement of the Coast Guard program for which I was selected to attain both degrees. Matt Higgins. He teaches Managerial Economics. I have never had a professor relate course topics to everyday life as much as he was able to do. He really inspired my interest in economics, and showed me just how important the basic concepts are to how the world ticks. As a result, I am now subscribed to three different economics podcasts and two economics magazines. I just can't get enough. Business Strategies for Sustainability. This course has shown me the ways that a capitalistic society can drive towards social responsibility. I have always cared about the environment; it was one of the main reasons I joined the U.S. Coast Guard, but I had no idea about the number of companies that have made sustainability a part of their mission. It's not just because they think it's a good marketing strategy either, but because being conscious about sustainability can yield shared value and profits. Its location at one of the premier engineering and technology universities in the world. The resources Scheller has at its disposal, like the Atlanta Technology Development Center (a technology start-up incubator on campus) and the Georgia Tech Research Institute, allow Scheller to provide a top notch education while also exposing students to the latest problems facing the world and the latest solutions being developed to address them. I knew that Scheller would be in the best position for understanding the problems facing the Fortune 500 companies headquartered in Atlanta, the economic hub of the Southeast, and I knew I wanted to be a part of that. What is the biggest lesson you gained from business school? Never stop learning. Never lose that childhood sense of curiosity. I will always follow my curiosity into new problems and topics and will continue to ask "Why?" every day. What was the most surprising thing about business school? Learning about the importance of networking. Coming from an engineering and military background, I didn't have much faith in networking. Now, though, I see how crucial it is not just for the obvious reasons, like getting a job, but also for making deals that determine whether your company succeeds or fails. I signed up for the 2015 Vanderbilt Latin Business Challenge Case Competition, sponsored by Deloitte, where we contemplated ways to make a start-up food supplement company more successful in rural areas of Central America. I wasn't really sure what a case competition entailed prior to the weekend event, but I went in with an open mind. It ended up being one of the most challenging and stressful activities I experienced while in school, but also one of the most rewarding. It was such a great experience to learn how I perform under pressure and in a group. We took second place in the competition, something the whole team was very proud of. I am passionate about adventure racing! I pursued two degrees simultaneously at Georgia Tech: an MBA and an M.S. in Civil Engineering. Reaching Out MBA (ROMBA) empowers LGBTQIA MBA students to become professionals who will lead the way to equality in business education, in the workplace, and throughout society. Through its programming, anchored by its annual conference, ROMBA educates students about the opportunities and challenges of being an LGBTQIA MBA student and business leader, inspires and enables them to be leaders in their careers and in society and builds connections among each other. Scheller Pride is a club for LGBTQIA students and allies to provide a supportive environment that will enhance the social, academic, and career experiences of current and future prospective LGBTQIA students, allies, and partners at Scheller College. The club establishes relationships and fosters dialogue with employers and alumni who value a diverse workplace and strive to equip future business leaders to be advocates in the workplace. With support from Scheller faculty and staff, I founded Scheller Pride as a club for LGBTQIA and ally MBA students. Our events include students as well as faculty and staff, so they are excellent opportunities for networking. Why did you choose the Georgia Tech MBA program over other MBA programs? I chose Georgia Tech because of its strong foundation in technology and data analysis. In today's world, nothing is accomplished without the use of technology, and large amounts of data are ubiquitous in every company. Georgia Tech has given me the tools I need to function in the modern business world. I also chose Georgia Tech because of its cultural fit. My background is in science, which fits well with Georgia Tech. The program is incredibly diverse with people from all backgrounds and industries so I didn't feel out of place. It also makes for a very rich learning environment. Please comment on the academic experience at Georgia Tech. I have been very impressed with the academics at Scheller. The professors are top notch and really care about learning. The program is full of people from diverse backgrounds and the professors will always take their time to thoroughly explain new concepts to those new to business. Classes are interactive and foster a lot of good discussion. There is very little basic lecturing and lots of hands-on learning. There are also a number of practicum classes, which are a great way to gain real experience while in school. Since I'm making a career shift, these have been invaluable to me not just from a resume perspective but also giving me the real tools I need to operate after graduation. What are some exciting opportunities outside of the classroom? I participated in a few case competitions, and my team won the national title in the Deloitte Supply Chain competition. This gave us amazing access to people from all levels of Deloitte and allowed for a practical glimpse into the world of consulting. Academically, I took several practicum classes. In Six Sigma, we did a project with an aluminum manufacturer to investigate and make recommendations into reducing its delivery times and carrying costs. Our recommendations saved the company several hundred thousand dollars per year, and I received my Six Sigma Black Belt as part of the course. In the international practicum class, we worked with a large Japanese e-commerce company to develop a strategic plan for launching a new service. This involved considerable research and communicating with our counterparts in Japan to analyze the Japan's market and benchmark competition worldwide. We then spent a week in Japan, meeting with the client and pitching our proposal to the head of the division in the executive board room.